Today’s content publishers may know it takes more than building a player into their sites to get the audiences and revenue they need from online video – but they may be unclear about how, exactly, to do so. Here are some tips on turning online video from a cost center into a profitable new publishing venture. Publishers increase views by having more videos, since users will watch video after video if they’re available and are good quality. Using experts to host your videos will ensure that the quality of the content is good, while hiring professional production crews will ensure that the quality of the production is up to par. Videos in your library also need to be tight and aligned. If you are providing the viewer video on recipes one minute and tech reviews the next, you will find yourself with a shrinking, and confused, audience. 1. 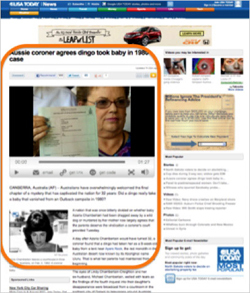 Placing the video player center of page, with an article on the same subject below it. 2. Add a video page to an existing topic area, accessible through a link on the text page that teases video titles. 3. 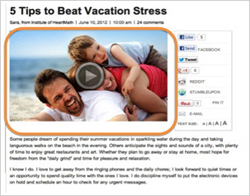 Make an article’s photograph click through to open related videos. For instance, at least one company’s player provides a playlist featuring numerous videos on the same topic. 4. 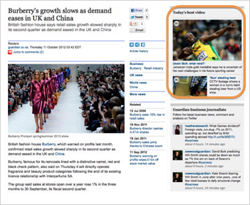 Allow current text content to dominate center of the page and the video to occupy an inefficient part of the page. Using this technique, called “rail placement,” completely new, “off topic” content can be offered up. The publisher might choose to let the video expand to full page upon click-through. For videos to be effective in organic search, it is also crucial you have the right kind. Search engines like Google and Bing feature video listings for three basic types of search queries: transactional, navigational and informational. Most people go online to get information -- to learn how to bake a princess cake for a birthday party or take better baby pictures. Video content that fulfills this need – like how-to, informational videos -- is four times more likely to come up in search results and pull people to your site. Consider your brand position as an expert on the topic and break down instructions in a logical, entertaining format appropriate for the audience. Having a content provider well versed in SEO will also increase your search success. 1. By adding mid- or post-roll to your video, you are essentially doubling your ad inventory and halving the cost needed to break even! 2. Multiple views can translate into additional ad impressions, which can divide the cost, as does adding performance-based overlay ad units to your player or using your content partner’s player. You may not need a $10 CPM or better to break even if you pay 30 cents a gigabyte, because you’ll be earning money other ways. However, to increase your odds and your revenue, you’re best off choosing a content network partner selling directly to agencies as often as possible, or, is doing other things to sell higher CPMs, like matching endemic advertisers to the content, as opposed to matching advertisers to the publisher. The formula for online video success is really quite basic. More quality video + smart placement + great search optimization + cost management = more revenue + more traffic. The key lies in mastering each part of the equation.